Are you bored of all phone covers looking the same? Do you want to protect your phone from impact, drop and scratch damages? Then you have come to the right place! Here at GoCustomized, you can make your own Sony Xperia M2 case. Design your custom Sony Xperia M2 case in only a few clicks with our easy to use Customizer. 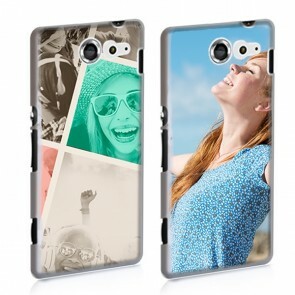 Just upload one or more images onto your custom Sony Xperia M2 case and proceed by adding a logo, text or filter. You also have the possibility to select one of our beautiful pre-made designs! Once you have created your custom Sony Xperia M2 case, various payment options are available to you. Your phone cover will be produced and shipped at lightning speed, in only 24 hours. Start now and make your own Sony Xperia M2 case! Your phone will finally receive the protection it deserves! When you use your phone every day it is normal that occasionally you will scratch it with your keys, it will fall off the table, or it will slip out of your hands while you are taking a selfie. When these things happen, it is best to ensure that your phone is adequately protected. Make your own Sony Xperia M2 case and protect your precious device from drop, scratch and impact damages at all times. All of our cases are made using high-quality UV printers and scratch-resistant ink. Another great thing about your custom Sony Xperia M2 case is that you can design it to match your style. You can make it look exactly as you want it to! How cool is that? Just start by uploading your favourite images into our Customizer. Adjust the size and orientation of your pictures and add a logo, text or a filter to your case. It has never been this fun and easy to make your own Sony Xperia M2 case. Once you have finished designing your cover, we will produce and ship it at lightning speed, within 24 hours! Try it out now! Make your own Sony Xperia M2 case today!